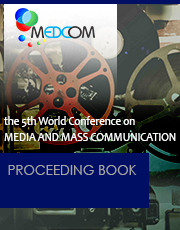 All accepted abstracts for 5th World Conference on Media and Mass Communication 2019 (MEDCOM 2019), will be published in the conference abstract book with an associated ISBN 978-955-3605-29-0. All full papers sent for conference proceedings will be subjected to double blind reviewing process and will be published electronically with an ISSN 2424-6778 in the proceedings with a DOI Number (DOI prefix: 10.17501). The International Journal of Cultural Policy is a peer reviewed journal that provides an outlet for an interdisciplinary and international exploration of the meaning, function and impact of cultural policies. Government Information Quarterly focus on: The impact of information technology on government innovation, transformation, and practice, An open, transparent, and accountable government, Data privacy, protection and security, Participatory decision-making and civic engagement and the role of information technology in promoting and/or limiting civil discourse, participation, and practice, Information flows in public spheres, Co-participation and co-production between the governed and the governing and the influence of technology and policy on the relationship between the public and government, The citizen, the state, information policy, and information technology, The development, implementation, and use of information systems and emerging technologies as platforms and delivery tools for government services and resources, as well as tools for decision and policy making.